Recently celebrating the first anniversary of their debut album ‘Vera’, Crooked Colours have been humbled by the overwhelming support from fans and industry alike over the last 18 months. The project has taken the trio to new heights, with the album hitting #1 on the iTunes Electronic chart and receiving a staggering 30 million collective online streams, which led to extensive touring of Australia, United States, UK and Europe totalling an impressive 84 shows and festivals to date. 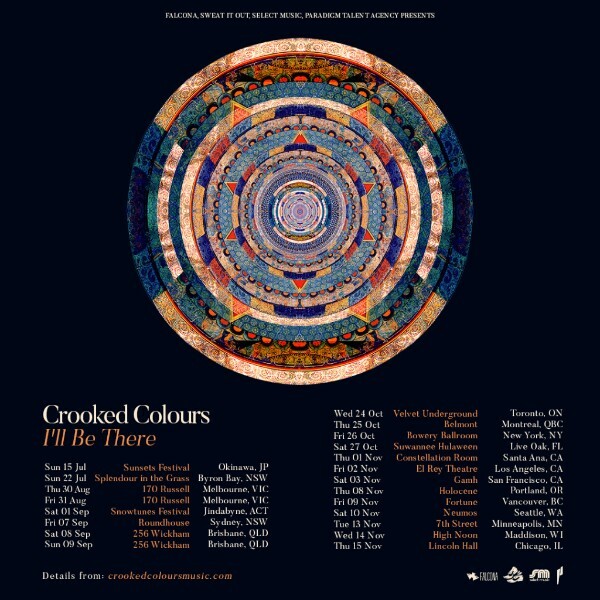 Not showing any signs of slowing down, today, Crooked Colours are excited to announce the first single ‘I’ll Be There’ to be taken from their sophomore LP due for release in early 2019.Penned during their time on the road, ‘I’ll Be There’ is a perfect re-introduction for the group, taking some of the instrumental timbre which has become synonymous with the Crooked Colours style, whilst injecting layered tribal influenced vocals, hypnotic loops, and driving synths throughout. Having only toured locally prior to the release of ‘Vera’ it is a huge testament to the band, that in their first overseas ventures throughout 2017/18 they managed to sell out shows in Los Angeles, New York, London, Manchester, Amsterdam, Berlin, and Stockholm only naming a few. Already kicking off a fresh run of dates with a debut performance in Japan, and a peak time slot at Australia’s premier festival Splendour In The Grass, Crooked Colours will be touring their new single ‘I’ll Be There’ to Melbourne’s 170 Russell on 30th & 31st August, before hitting upSnowtunes Festival in Jindabyne on 1st September, and finally heading back to Sydney’sRoundhouse on 7th September and Brisbane’s 256 Wickham on 8th & 9th September. For an added treat, the boys are bringing local legends Yahtzel, Airwolf and Unearthed Highwunderkind Ninajirachi, around the country with them. With a further 13-date tour of the United States recently announced, there are a plethora of opportunities to catch this captivating trio. ‘I’ll Be There’ is out now on Sweat It Out. COURTNEY BARNETT Releases 10 Live Videos + AUS Tour Starts Today!